Finding good opportunities to trade my unwanted games for games on my wanted NES list has proven to be more difficult that I had thought. Generally, there are more collectors in my network who are looking for NES games and fewer collectors who are looking for games that I’m trying to get rid of– Playstation, XBOX, Wii and so on. Fortunately though, I was able to make a good deal with one of my best retro gaming buds– Rob, who happen to be looking for a few of the NES games and PS2 games that I had for trade. Earlier that week, I had accidentally purchased all three RBI Baseball games for the NES when I only needed the third, due to my not keeping my list of NES games properly organized (it always helps to keep your list of licensed and unlicensed games in different columns). So I had RBI Baseball 1 and 2 up for trade, which happened to be the two that Rob needed. And so we were able to agree on trading those two games for Fisher-Price Firehouse Rescue and Lode Runner. This was probably the third or fourth trade with Rob, who is always generous enough to throw in some extra goodies. This trade was no exception. He also included one CIB Sega Genesis game that I didn’t have and the box and manual to Home Alone for the original Game Boy. In addition to the NES, boxed Game Boy games are one of my favorite things to collect. And since I was in the process of trimming down my Playstation 2 collection, I decided to go ahead and throw in several titles that I knew Rob wanted. While these two NES games aren’t particularly notable additions to the NES collection, they are two that I needed and am super happy to add to the collection. 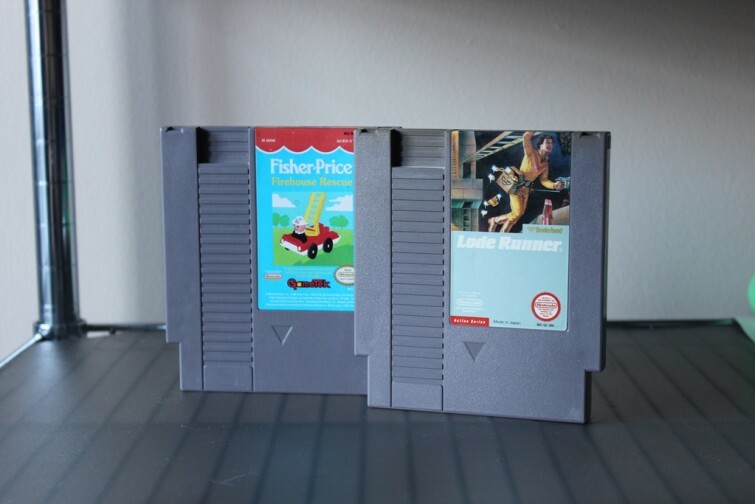 In the 1980s, Fisher-Price began releasing several games aimed to younger audiences. Most were released only on PC or Mac, but three were ported onto NES– Firehouse Rescue, Perfect Fit and I Can Remember. All three are fairly common and can usually be found for around $5. Firehouse Rescue will be the first addition from Fisher-Price in my NES collection. Also originally developed for computer, Lode Runner was one of the first video games to feature the option to create your own levels. The NES version (released by Hudson Soft in 1984) included 50 levels, scrolling screens and more cartoony graphics. Although, it lacked the build-your-own-level capability. It was one of the earliest third-party games made for the NES. This trade brings my collection from 251 to 253 NES games. For the rest of the entries of NES Quest, check them out right here on Retro Chronicle. Awesome dude! Thanks again for being overly generous! I owe you one! Thank YOU, Rob. We’ll definitely do some more trades this year.